In an opening that mimics Fukunaga’s debut feature Sin Nombre, we see Jane Eyre (Mia Wasikowska) step out of a castle and into a vast rocky land of nothing. As an audience, we assume her slate is clean, but later the scene is contextualized to give you a better understanding that Eyre’s predicament is anything but innocent. Her hardships are many, wherein she encounters the wrath of her aunt, the loss of a friend, and the trappings of subordination. I had not seen any of the 20+ incarnations of Jane Eyre, so I stepped into the film with rudimentary knowledge of Bronte’s novel. Despite my shortcomings, I believe I could pick out the specific implications that Fukunaga had on the narrative itself, particularly in regards to the spiritual elements that the film illustrates. There’s a lingering sense of dread throughout most of the picture, which works extremely well given the way the narrative unfolds. Ghosts and demons seem to drift in and out of the film’s dimly lit corridors. 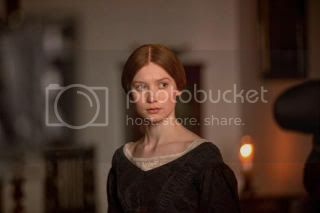 Given that Jane Eyre takes place largely at night, the flickering candlelight offers such fantastic suspense and fright. At its center, the film is a wonderfully told love story about two classes of people whose “tale of woe” almost becomes a game of one-upsmenship. Edward Rochester (Michael Fassbender) is the aristocrat who hires Eyre as governess of his castle – Fassbender plays the role with false bravado, as his past haunts his every move. Despite the tinge of despair in both Eyre and Rochester, their relationship simmers with intense sensuality. Both Fassbender and Wasikowska have incredible chemistry, making their scenes feel incredibly palpable and realistic. Their relationship recalls the quiet romanticism of Bright Star’s Fanny Brawne and John Keats – so hopefully that’s enough to get people interested in it. On a sidenote, my screening of Jane Eyre had director Cary Fukunaga and actress Mia Wasikowska in attendance. It was an insightful discussion, with which Fukunaga noted something of particular interest – he had read hundreds of scripts when deciding on his next project, with only two sticking out as even remotely good. The first was obviously Jane Eyre, and the second, to which he lost out on the opportunity to direct, was Never Let Me Go. I’ll be watching that tonight.